From Karina: ....there is more!!!! From Karina: JOY of being a MOM. A message from my Daughter. From Karina: The process says.... Trust me! TRI MAGIC: If I can do it so can you! When we learn to understand that challenges are in our lives to assist us in becoming more whole and finding a much better balance, we can begin to embrace and trust our path with everything we attract into it, find peace and happiness and walk through life as a responsible individual. 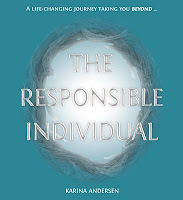 A purchase of THE RESPONSIBLE INDIVIDUAL (book) is automatically a donation towards The SmilingOne Foundation and their community programmes. Purchase Price of USD40 goes in FULL to the Foundation. © 2007-2017 by Karina Andersen, Cape Town. All rights reserved. This website is protected by copyright. No part of this website (text, illustration or information) may be used (printed, published, propagated, etc.) in printed form or in any electronically stored or processed form or may be changed for other use without prior written consent of Karina Andersen email me, except for private, individual purpose. If Karina Andersen agrees with the intended use, the content of her pages must be used unchanged and with full reference (including hyperlink) to its source!